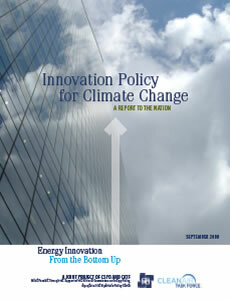 Energy Innovations Systems is a joint project of the Consortium for Science, Policy & Outcomes (CSPO) and the Clean Air Task Force (CATF), with support and cooperation from the Bipartisan Policy Center (BPC). Phase 1 began with the goal of bringing the lessons of technological innovation to discussions of climate change mitigation. Phase 2 is now in progress and focuses on exploring the current and potential role of the U.S. Department of Defense in spurring energy technology innovation. To improve government performance, and expand innovation options and pathways, Congress and the administration must foster competition within government. To advance greenhouse-gas reducing technologies that lack a market rationale, government should selectively pursue energy-climate innovation using a public works model. To stimulate commercialization, policy makers must recognize the crucial role of demonstration projects in energy-climate innovation, especially for technologies with potential application in the electric utility industry. To catalyze and accelerate innovation, government should become a major consumer of innovative energy technology products and systems. Several independent teams’ recent studies of technology and energy innovation policy display substantial convergence on basic policy design principles explained and illustrated in our follow-up synthesis report. Download the synthesis report here. Click here for video of a discussion on the report’s findings. The intent during Phase 2 is to develop policy recommendations for linking DoD more closely to the nation’s larger effort to reduce dependence on fossil fuels and limit greenhouse gas emissions. The project builds on Phase 1, which underscored the significance of defense spinoffs and policy/organizational lessons from DoD for other agencies, including the Department of Energy. The entire range of DoD activities from R&D through procurement, deployment, and operations will be of interest. DoD’s approach to technology development is being examined through case studies, commissioned papers, and institutional analysis. Work along these three tracks was presented and discussed in a one-day workshop in Washington, DC in May 2011. The case studies included gas turbine engines, batteries, and alternative fuels. The commissioned papers focused on military installations, ARPA-E and DARPA, commercialization and firm behavior, and nudging organizational change in DoD. Further institutional analysis will explore organizational structures and incentives that have contributed positively or negatively to DoD’s post-World War II technology development efforts (including R&D planning, evaluation of R&D outcomes, prototyping, testing, and demonstration, requirements-setting, and post-deployment user feedback and design modifications). 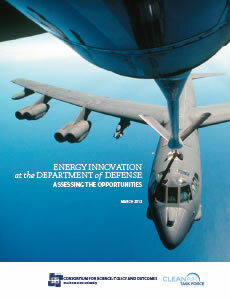 Click to view DOD Energy Innovation Atlas.